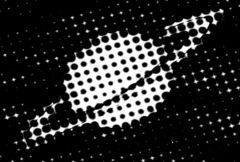 Generates a halftone version of the source clip using a black and white pattern of dots. Use the Smooth Source parameter to remove some details and make the dots more consistently round. Dots: Popup menu, Default: Black . Black: dark dots are used on a bright background. White: bright dots are used on a dark background.